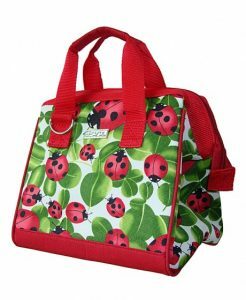 The popular Snack Happens bags from Itzy Ritzy now come in a smaller size – perfect for tiny hands. Keep crackers, fruit, sandwiches and treats stylishly contained in these mini snack bags. The eco-friendly zippered carriers come in modern patterns so adorable you'll forget plastic bags ever existed. Even better, they're machine washable so cleaning – and reusing – is easy. The Itzy Ritzy Mini Snack Bags comes as a set of two. 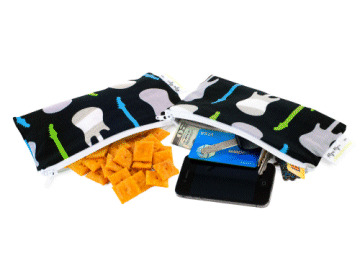 They are reusable, machine washable bags for snacks, sandwiches and so much more. Made with an FDA approved, BPA-free machine washable lining, the Snack Happens bags are also lead free, phthalate free and CPSIA certified. They work great with sliced fruit, sticky or messy foods as well as any dry snacks. Additional uses include things like makeup, keys, iPod, mobile phones and the possibilities are endless. The zipper top allows for silent snacking and is ideal for little hands.